Since the dawn of the Internet, bad guys have been trying to hijack our web browser settings. With a few lines of nasty code, a third party can change your preferred search engine, install unwanted toolbars, set a new homepage, track your movements around the internet, redirect to you to questionable sites, slow down your computer and – worst of all – make you even more vulnerable to future browser hijackings and other malware. Google Chrome is fighting back against these kinds of hijackings. According to a new post on the official Chrome Blog, developers have added a new feature to the Windows version of the browser that autodetects changes to its settings. 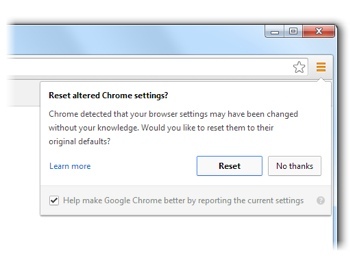 Should someone try taking Chrome hostage, you’ll now get a prompt (shown) asking if you’d like to reset the changes. The new reset feature was first included in Google Chrome in October. Using the option restores Chrome to factory default. This will disable any apps you may have installed, like Chrome’s cool new voice search extension. You can re-enable your preferred settings in the menu under More tools > Extensions. For more on Google’s browser, including Chrome’s new parental controls and cost-saving settings, visit google.com/chrome.